The eurodollar continues to flirt with the USD1.40 level as the markets wait for the FOMC statement and a trading day which has seen equities continue to fall as risk aversion once again takes hold. In addition traders are waiting for Obama’s state of the union address while watching Treasury Secretary Timothy Geithner suffer a mild grilling by the House oversight committee into his role in the AIG bailout. 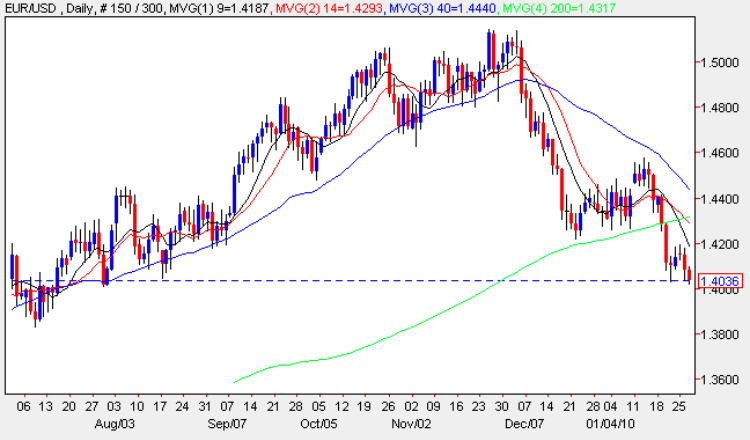 From a technical perspective the euro vs dollar is looking particularly vulnerable as the price action well below all three of our short term moving averages and also below our 200 day ma, and whilst last year’s sideways consolidation at this level is providing a degree of support we could see the eurodollar re-test USD1.37. Dollar bulls will also be heartened to see both oil and gold are falling and the dollar index looks to be inching towards 79 with the price finally sitting above the moving averages. However, we will have to wait for the FOMC statement to see if the dollar can continue to strengthen. Although the fundamental news for the eurodollar is primarily focused on the US and the FOMC statement the Greek debt crisis took an interesting turn today when yields on Greek bonds rose to their highest level since Greece joined the euro in 2001. In addition the Greek finance minister was forced to deny that there had been no deal (so far) to sell the bonds to China. Promoting such a deal is Goldman Sachs.